Tonight at Chicago’s Civic Opera House, the American Ballet Theatre (ABT) presents an All-American Celebration featuring the choreographic works of Jerome Robbins, Paul Taylor and Twyla Tharp as part of their 70th Anniversary Celebration. Tharp’s The Brahms-Hadyn Variations is a ballet for 30 dancers which will feature Gillian Murphy, Jose Manuel Carreño and Julie Kent to name a few of the big guns. Paul Taylor’s Company B, choreographed in 1991, is a fun romp set to music by the Andrews Sisters. But I’d like to focus on Jerome Robbins’ Fancy Free, a story of three sailors on leave during WWII in NYC and lookin’ for love. Fancy Free premiered at The Met in 1944 and was Robbins’ first try at choreographing a ballet. Needless to say, it was a hit! Robbins, also a Broadway dancer, collaborated with then-unkown Leonard Bernstein who composed the music and Oliver Smith who designed the set. These young artistic guns were just 25 years old. The ballet was such a success that it was quickly adapted into a musical comedy On The Town, which then was turned into the movie starring Gene Kelly. 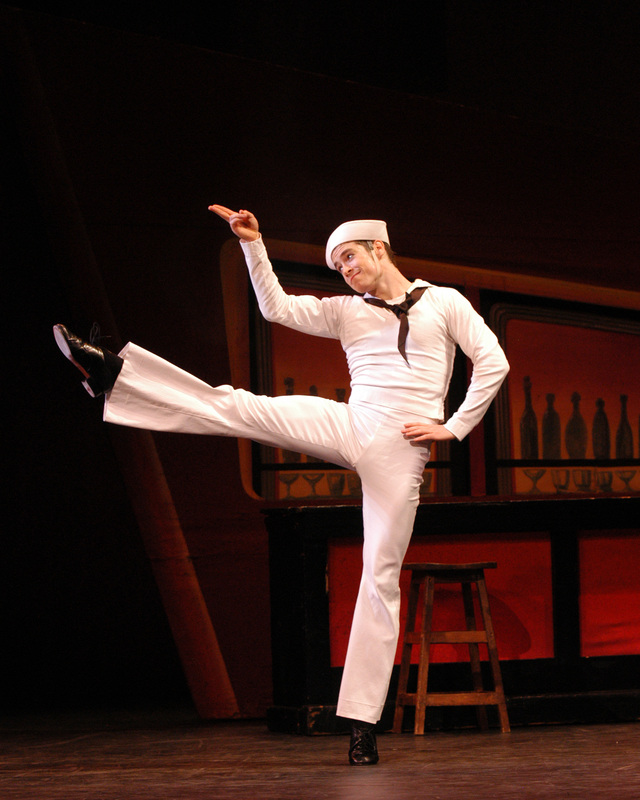 Tonight’s sailors are Daniil Simkin (see earlier blog post! ), Carlos Lopez and Sascha Radetsky (pictured above). Radetsky is making his debut in a new role, while Simkin is debuting in the piece and in Chicago. A problem arises as the three sailors meet two girls: inevitably someone is going to get left out. A light-hearted competition ensues showcasing a clever network of solos, duets and ensemble work. Set on a hot summer night in the Big Apple, this little ballet with tons of personality and swagger is now one of ABT’s trademarks.